Do you have a plan if an accident were to strike? At Pets R Family Too, we plan for virtually any accident or emergency that could happen so you don’t have to. If you need immediate assistance in making a decision, especially if it’s in the middle of the night, give us a call right away. We can provide additional information for your situation and get you the help you need. The most critical step in providing care for your pet during an emergency is not panicking and staying focused on getting them the help they need. Give your veterinarian a call or ask them in person if they provide a 24-hour service. While not all vets are available overnight, they will often have a contact for an emergency clinic nearby. It is important to know where the nearest veterinarian clinic is for your pet, or pets, in case anything happens. 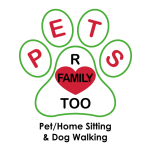 At Pets R Family Too, we have a list of local vets in case you don’t have your own list. But it’s always best to create a list with your preferences for a dog sitter and for your own records. Once you get the information of a local clinic it’s also important to keep it somewhere where it is easily accessible. An emergency number is no good if it is tucked away in a forgotten drawer. We recommend keeping any local emergency clinic addresses and phone numbers tacked onto a refrigerator. Saving this information in your phone is also a great backup, and even quicker to access at times. Pets that have been injured can become aggressive even towards their pet parents during their fright and confusion. It’s important to be calm and approach pets with caution when they are hurt. If your pet does not show aggression when you approach them, you can make a quick stretcher and place them on it. Be careful to support a pet’s spine, neck, or bones that may have been injured. If you have a car and can transport your pet to a local clinic, then take them there immediately. Otherwise you can call us and we can make sure that both you and your pet will get to the veterinarian of your choosing. We service Green Valley Ranch and surrounding areas, and it’s best to give us a call at 702-614-7663 no matter what is happening so that we can assist you with anything that you may not be familiar with. During accidents, the smallest things and knowledge can make a huge difference in recovery times later on. If you are led to believe that your pet has been poisoned, call your local veterinarian or the Animal Poison Control Center at 888-426-4435. This national toll-free number has trained specialists on stand-by at all times, ready to assist you with a recommendation based on your pet and what they ate.